Hi there, are the X280 and X380 globes, type 80 rectifiers? Thanks everyone! Yes they are. The ones I have labelled 80 are medium sized coke bottle shape, whereas, x280 and x380 are globes. Thank you Kevin for alerting me to the RCA Radiotron Type 80's. I'm running a couple in on my SE84UFO3 mono blocks and they are very sweet indeed. I'm entering the world of serious rolling... much fun lies ahead. Tried ST type 80's in the Zen-CKC. I like the RCA's best, next the "made for RCA /Cunningham's", The NU came in last. When all said and done the Mullard & Mitsubishi GZ34 are my faves with 5R4GYS Phillips and RCA's just behind. RCA 5U4's next. What sort of price should I expect to pay for a Mullard GZ32 ? Thanks, that's exactly the price I found one. Being new to buying tubes just wanted to know if that was within reason. I'm beginning to dip my toes into the Type 80 rectifier tube pool. I now have four to play with: an Arcturus/Crosley globe, a pair of RCA small bottle type, and a bottle type RCA. So far I've just used the globe. . . and really like what I'm hearing. I believe at the moment the most reliable source for NOS Mullard GZ32's is a company in Ontario which sells over eBay, and that is the price they ask for (plus S&H). I believe they are a retailer for the SME tone arms as well. I have dealt with them twice and they are pretty good to do business with. The Arcturus globe is a really nice rectifier. Warm and sweet. I can be very happy with this one. Now I have the bottle-shaped RCA in. This one has the same bass balance and yet is more detailed in spatial cues and more dynamic. It's only been in an hour or so . . if this keeps up it may become glued into the Taboo Mk IV. I'm using the RCA 12AU7 (?} that Steve sent with the ZROCK2 in the ZROCK2, and a Sylvania 7308 in the Taboo Mk IV as well as Svetlana SV82 and the Type 80 RCA. I'm leaving this tube complement in for a while, really nice sound. I’ve had the Sophia Electric 274B in my UFO2 for some time now so I believe it is now burned in to the point that I decided to roll the Mullard GZ32/CV593, Cunningham CX-380 Globe, Majestic Type 80 Globe and the AWV type 80 ST. The objective was to see if there would be an immediate discernible difference since I am now used to the Aqua 274B. Therefore, this is not an exhaustive review of the tubes. It was very obvious and the Aqua 274B is now my rectifier of choice in the UFO2 but not the CSP3. The best way I can summarize the difference is that each of the others have their own strengths, a little more detail vs a little more warmth vs a little more dynamic. The Aqua has it all with great balanced of each of the qualities. In addition the scale of presentation is larger and the separation between instruments and vocals far more obvious. The Mullard would be my runner up. But it all comes at a price. So if budget is a consideration the type 80 are great alternatives. In a case where budget is a consideration do not try the Aqua 274B. If you get used to that one there’s no going back. I would emphasize that this is in the context of my system and tube complement. I did try the Aqua 274B in both the CSP3 and UFO2, I have two, I always keep a spare. I did not care for that combo so I have it in the UFO2 only. 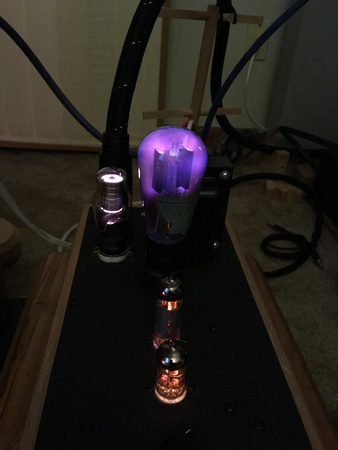 I'm hesitant about the Aqua for several reasons, chief among them that I really am not a big fan of the Valve Arts 274B and suspect this tube may hold similar traits. I could be wrong, and when I've had the SE84UFO3-25 Monoblocks I've ordered in hand and broken in I may consider investing in a pair. Right now I'm enjoying the three different Type 80 that I have purchased, each has their charm and I'm hard-pressed to name a favorite. The small straight ones being a matched pair will get a trial in the Monoblocks when they arrive and have a very compact and detailed, warm sound. The Crosley/Arcturus globe has a big resonant sound. The RCA ST-type shares a lot of the characteristics of the globe but with more spatial cues, seemingly more "resonant." Great tubes to have. I'll be keeping an eye out for different types in pairs while waiting for the Monoblocks. This is terrible Lon. I don’t have an Arcturus Type 80 to compare and I’ve blown the tube acquisition budget. You’ll just have to get an Aqua so we can know the difference between it and the Arcturus, right??? Ha, we'll see. I bet it sounds like one of the tubes you have. All three of these types sound pretty similar, with distinguished characteristics separating them. . . but much more similar than different. I'm thinking I'm going to want a matched pair of globes to try in the Monoblocks. . . that will be my first target. I would need to spend more time comparing the two. I’ll see if I can spend some time tonight or tomorrow and get back on this. Now if only we could get Lon to compare with the Arcturus . First, thanks for asking Alper as I’ve enjoyed an evening of music which I desperately needed. The difference between the the GZ32/CV593 and the Aqua 274B was readily evident and it’s not that small. The Aqua has more prescence in the mids and comes across as more complete more coherent across the frequency band, although sometimes a touch heavy on the mids, depending on the recording. This makes the Aqua more engaging, more organic. For the first time I found myself trying to sing along with the singer(s) (kind of embarrassing for me but there it is). Accompanying instruments are far more discernible and present. Piano, string instruments, wind instruments are more complete never blending never competing and always presented in more evident layers. In live recordings the venue is more evident. Vocals are breather, strikingly present. Some wind instruments, blues harmonica for example, came across a touch... raspier? More bluesy, made me want to find my harmonica (yes I have one and I’m not that good at it). The GZ32/CV593 is a little more back where as the Aqua seems to surround one in a sphere of sound, not forward though. Lons comment about the Type 80’s is right on, except that I have not heard the Arcturus and by the looks of it I will not know the difference . Of the Type 80” that I have the Aqua is also quite different from them. However a word of qualification is in order here. My associated driver tubes are Siemens and Valvo, these, as described by some, tend to be somewhat less “warm” than say Amperex or RCA’s. I do have an Amperex Buggle Boy 6DJ8 and a Mullard 6DJ8 and 7DJ8. Going by memory, these did tend to bring more mid prescence to the GZ32/CV593 but not in the same way as the Aqua and in the case of the Mullard, a little dry for my liking. I also have a ZR2 and that component did make a significant difference. I guess what I’m trying to say is that my system is not the same as yours and so I cannot say that the Aqua will make the same difference in your system. So if this causes you to acquire an Aqua and you do not like it as much as the GZ32/CV593 let me know, I have a spare NOS GZ32/CV593 I’ll swap for it. I can always use another spare if you would want a spare as well. No adapter is required to use the Sophia Electric Aqua 274 in a Super Zen. Thanks, Buster. What other tubes are you using there with the Sophia Electric? Original output tubes that came with the amp (less than a year of use) and an expensive Telefunken E88CC that I got from Upscale Audio. When this tube goes bust, I will not be replacing it with such an expensive tube again. It is a great tube, but I have learned my lesson. I would rather put that money into more music to listen to. I’m using Siemens E88CC grey shield for the driver and NOS Svetlana SV83 for the power. The SV83 are the “older” version. I got the Siemens at a very reasonable price and so picked up 4 spares so that should do for quite a while. I think I got them for about $50.00. Last I looked they were crazy expensive. Couldn’t say as I have had no experience with that tube. Only one way to know for sure. I’ve often taken the comments of others as a start. But only first hand experience will tell for sure. Alper, I dropped in a Sophia Aqua Wednesday. Pulled the GZ/32 to do it. They are both great tubes I'll have to get some hours on them to decide if I even have a preference. I do not know if this makes sense, but this tube seems to increase the headroom of the amp. In comparison to the NOS Mullard GZ32, which has been my favorite rectifier tube, the bass is a bit tighter and more controlled. In some albums, the album with the GZ32 could sound slightly, but just slightly, boomy. I have attributed this to no room treatment more than anything else. But with the Sophia, it sounds a little less so. Ah come on Alper it's not that ugly. Well I would have to agree with Alper on the appearance of the Sophia when it is installed amongst the associated tubes. Kind of seems out of place, but I can live with the appearance. I would also stress the point that Alper made and try to in my comments about system synergy. I do not believe it’s a matter of how one tube ‘sounds’, rather it’s the combination and of course the components. In my case the rectifier in the CSP3 makes a significant effect on the UFO2. I have rolled too many to list. I did so to get a first hand understanding of what one can expect from rolling tubes and the limitations of doing so. Otherwise as much fun as it can be initially, rolling tubes can become an unrewarding distraction. After inserting the Sophia in the UFO2 I rolled rectifiers in my CSP3 with ones that I have kept in my inventory of rectifiers to see what the overall result would be. The result changed quite significantly as the rectifiers in the CSP3 were rolled. It was the combination of the AWG 5AS4 in the CSP3 with the Sophia in the UFO2 that produced the end result and not one or the other alone. The interesting thing is that I always seem to prefer the AWG 5AS4 in the CSP3 in combination with whatever rectifier I put in the UFO2. So now I have settled on that one one the CSP3 and roll only the rectifier in the UFO2. That also has now come to a conclusion, after all this is about music and the musicians for me. Thanks for the update, John, and also your reviews of the NOS Mullard GZ32 and the Sophia. Amazing sound... I cannot imagine what the new Anniversary would sound like, hearing this one! I feel the same way about my UFO2. But, I’m in for the A-Amp. Largely because the system has exceeded my expectations to a degree that left me with this feeling that a lot more is possible with the 2 watt amp with the right high efficiency speakers. Getting the ‘right’ mating components is always a challenge whether it be high or low efficiency. At times I still have to get my head around the speed of the system. The truth is that all these amps and preamps respond to tube-rolling to a degree I have not encountered in other amps because of the simplicity of the circuits. Each tube's characteristics interact with the others. There are endless variations possible! I tend to anchor a complement around a rectifier. . . but then I can fall for another rectifier and the rotation begins! Right now I'm really enjoying a small RCA type 80 rectifier with a GE 6DJ8 (the ones that appear blacked out). Never enjoyed the GE before with any other rectifier, but this combo is really something. There was a time about six years ago where I felt that tube-rolling was about to drive me mad. I swore off it for a spell. . . but now I notice I have a cabinet of tubes again and I'm back in the game. I'm holding off on further rectifiers though till the 25 Anniversary Monoblocks arrive and I cycle through the tubes I have. Tell me about it Lon! Among the four tube amps I have, I have enough stuff that would carry me for another 30-40 years! I am not even getting into bass amplification at this point, as I have mostly SS stuff and only some of my recording gear has tubes. Right. I've been lucky and haven't rolled many tubes in my guitar and bass amps. . . and my favorite two these days (Fender Jazzmaster Ultra-light SE, no tube; Fender Bassman TV Fifteen, one tube) don't really require rolling. But man. . . the endless possibilities when you have three or four dozen tubes. I picked up a Sophia Aqua this week based on the reviews here. So far I've only used it in my Yamamoto amp, where initial impressions are that its not quite as good as the 40's RCA JAN 5U4G that it replaced. The Yamamoto 45 is quite different from the SE84UFO though. I'll try it in the UFO this week coming and report back. Thanks for the tip, this is one that wouldn't have been on my radar otherwise. I think the blue color is a kickback to the 1920s Arcturus tubes which had blue glass. Kevin, what are your impressions of the Sophia in the Zen amp? For me, the Sophia Aqua 274B brings more focus and firmness to the presentation than the 80 globe does. That said, I still prefer the 80 globe with its warmth and spread. It’s friendlier, for want of a better description. Still sounds best to me. Now that its got some hours on it, I find that like the Sophia tube a lot in the Yamamoto 45 though. Interesting. I have both tubes and 80 globe has been in for quite a while. I may give the Sophia another try since I've been listening to the 80 for so long. I really like both of these tube types, the Sophia Electric 274B Aqua and the Type 80. I have type 80 bottle shaped in RCA and Tungsol pairs and I have a third RCA, and I have one globe 80, an Arcturus. I slightly prefer the 274B Aqua in the Monoblocks though I might prefer the Arcturus globe 80, its sound is a bit less focused but a bit warmer . . . but I don't have a pair of globe 80s to try. I'll hang with the 80s in the Monoblocks and the Arcturus in the Taboo Mk IV and I have RCA 80s in the Torii Mk II and Tung-Sol 80s in my CSP2+ and Taboo Mk III in my second system. I'll keep an eye out for a reasonably priced pair of Type 80 globes. . . . I am done for now with the type 80 globe tubes. Over the last year, I have used several tubes to failure in a variety of amps. Some were from eBay and some were from a reputable vendor. I have one type 80 globe remaining to use in a stereo amp. Sorry to hear that busterfree. Those things are not cheap. I too have joined the club and I've got a bunch of different manufacturers in all the bottle shapes. I'm using the newest ( straight glass shape ) in my SE84CS and my ZP3. I love the sound. That said, however, the globes especially won't go in there until I modify the power supply. Historically the data sheets list a max cap value after the rectifier of 30 uf. The ZP3 is 47uf and my SE84CS is 40 uf. That stresses the tubes. We're all taking a chance, but especially with the globes as they were the the earliest ones made and probably more fragile. I need to get into the SE84CS and change the PS config to make it safe for the type 80 rectifier. I really do like it a lot, even more than my EML 5U4G mesh plates, and that's saying a lot. Great tubes. Sorry to hear also Busterfree. I have been using the same Philco Globe in my CSP3 pretty heavily for eight months or so. The others I have tried, globes, coke bottle, and straight all sound good in their own ways, but I generally prefer the globes in my setup. No troubles yet, fingers crossed. The main CSP3 power supply uses two 47uF electrolytic caps. Mine is heavily modded, but at present still stock power caps, though bypassed. I too have not encountered any problems or failures with Type 80. The only globe one that I have, an Arcturus, actually has a base that is a little loose and I treat it with careful kid gloves, and it has not given me a problem at all. The others are all bottle-shaped with the exception of a pair of small straight-shouldered RCAs and they work flawlessly. I admit I don't have months and months and months of use, but I've been using them. I'll keep an eye out for trouble. Though I have the Sophia Electric Aqua 274B back in the Monoblocks and they'll probably stay there. . . . My CSP3-25 just went to packing and we'll see what sounds best in that component. . . . I like the type 80 globes, but I cannot run thru them as fast as I have been. They sound good but not at this rate of failure. I have a few straight and bottle shaped globe 80 that were not as expensive or hard to find. They will get their turn when I put a stereo tube amp back into my TV system. I like the Sophia Aqua, but I only have one. The monoblocks are main listening amps right now.